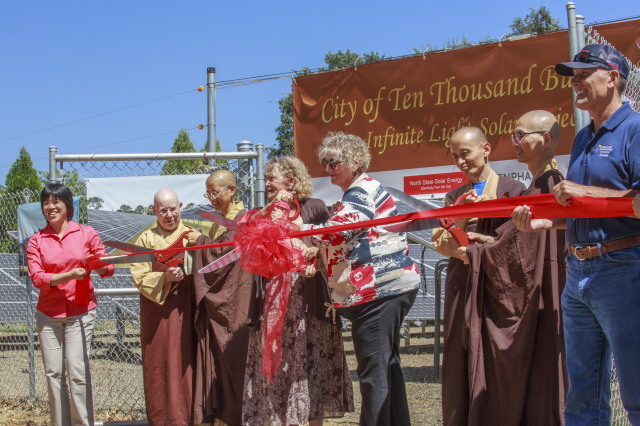 A ribbon-cutting ceremony for the Infinite Light Solar Farm of the City of Ten Thousand Buddhas took place on August 27, 2016. Mendocino County Chief Executive Officer Carmel J. Angelo and Mendocino County Supervisor of the 1st District Carre Brown both came for the ceremony as well as neighbors of CTTB. A total close to 40 people attended the ceremony. The Buddha Jewel emits limitless all-encompassing light. That light shines on the treasury of empty space in the Dharma Realm. Truth can be opened up, be revealed, be awakened, and be entered by us, using proper knowledge and views. Each of us can reach the unsurpassed Bodhi of those ultimately awakened. She trusted that the power of these syllables will contribute to the efficiency and efficacy of this solar process. This project is a 500kW solar photovoltaic system, currently ranking number two in Mendocino County, after the one at Mendocino College. It is expected to eliminate 14,000 tons of carbon emissions from the environment during the 25 years of the manufacturer’s warranty. The growth in population and electricity rates increasing 6% every year over the last decade made the increasing costs of energy a growing concern for the CTTB utilities group. Now that CTTB is using solar energy, it will also save several million US dollars in the cost of electricity over the lifetime of the solar farm. Dharma Master Jin Yan, Jin Fan, Heng Chih, Heng Liang, honored guests Carmel Angelo, and Carre Brown cut the ribbon together. And then, all people on site chanted in harmony and beautifully the English version of the Transference of Merit and Virtue Verse to conclude the ceremony. Amy Chang-chien, coordinator of this solar project, pointed out that traditional solar system has a centralized inverter to change direct current to alternating current. When the inverter is broken, the whole system will stop working until it is fixed. Each solar panel of the Infinite Light Solar Farm at the City of Ten Thousand Buddhas has its microinverter. If a microinverter is broken, one can just replace the damaged microinverter. The whole system will keep working without interruption. This will make the maintenance of the solar array easier and more cost efficient.